I did a lot of driving this weekend. It started Friday night when my wife and I went out to dinner at a restaurant highly recommended by someone at her work. So a trek about 30 miles up NE brought us to Chama Gaucha. Thankfully we did not have a Bridesmaids experience with the place and completely enjoyed the entire meal. The following day, we took an even longer ride (95 miles) to New Buffalo, MI for a little casino action (losers). About 10 miles outside of New Buffalo is an antique mall that we haven't visited in quite some time. We stopped there first for the joy of looking around. Plus, I hoped for some cardboard. A couple booths had some vintage, but I wasn't biting on the prices based on the quality. One booth, thought, that had something I have never seen before. The dealer had a dozen or so cards, and at the sale price of $8 per, I took a pop on one. After a little research, this is a T218 Mecca Champion. It has a Hassan brand back. Besides a small crease in the upper right, this is a nice looking card. At $8, I may have been a couple bucks over ebay, but I am not too worried. It's a nice oddball, and a set I may have to look into building sometime in the future. Come Sunday, I was going to visit a card show that I have never heard of before. Instead of my normal Orland show, I drove south 40 miles to Coal City High School. Turns out, it's a once a year show that coincides with a dodge ball tournament. Small show with maybe 10 dealers. 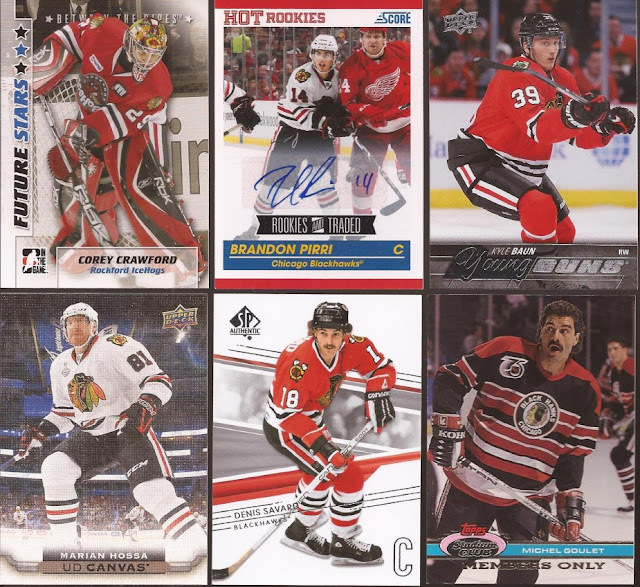 And of the 10, just 4 had cards, The rest were comics or autographed photos. But I lucked out at a couple of the tables. The Pirri auto goes into the "players who have worn Hawks sweaters" collection, which really doesn't exist, but for $2, I couldn't pass. All the rest were either 50 cents or a buck each. Savy and Goulet know how to rock the mustache. Plus I needed that Baun YG. 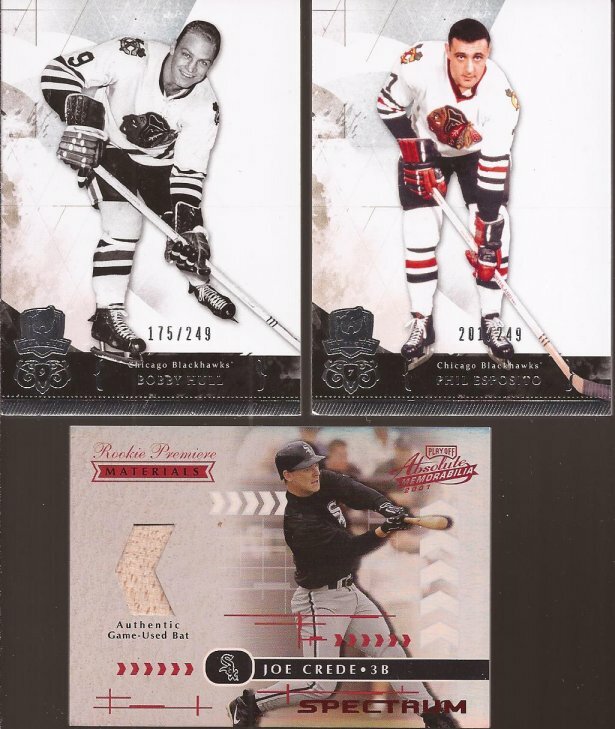 From the same dealer were the top two cards from the Upper Deck "The Cup" release. I'll take two base cards for $6 that come from a $430 for 5 cards box. And yes, that is Tony O's older brother Phil as a Hawk before he was traded to Boston for Whitey Stapleton and a couple other players. The Crede relic at the bottom came from a dealer that had 7 for a $5 box, plus relics for $5. Technically, I picked out $15 worth of cards, but he gave them all to me for $10. So a Crede relic #/25 for 75 cents? Deal. Here's some more that ran me 75 cents per. 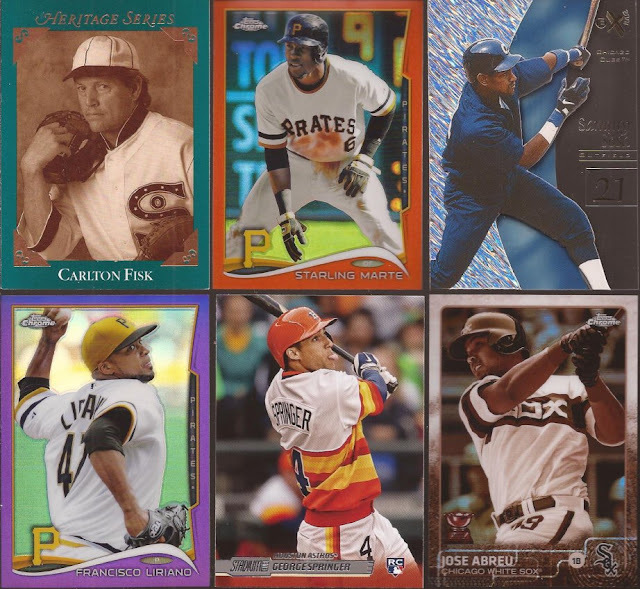 All hit the throwback binder. And some more at 75 cents that made it into the bunting binder, including two of Plaschke fav Kemp. So while I did okay, I was disappointed of the low number of sellers. Luckily, I knew there was another show yesterday up in Buffalo Grove that went until 3pm. It was over an hour drive from where I was, but I was going for it. So 75 miles and a couple tolls later, I arrived at the 2nd card show of the day. And I really wished I hadn't driven to it. It was tabbed at 20 tables, but it was held in a card shop. There was maybe 4 guys there with anything out I could dig through. It does appear to be the home base of a killer dime box seller Nick and I have hit before, but none of his boxes were to be seen. I really wanted to dig through some dime boxes. 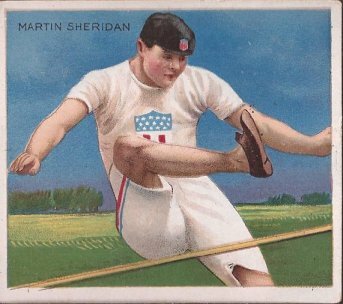 Well, I did find some boxes to dig through, and spent about 50 cents per card when all was said and done. 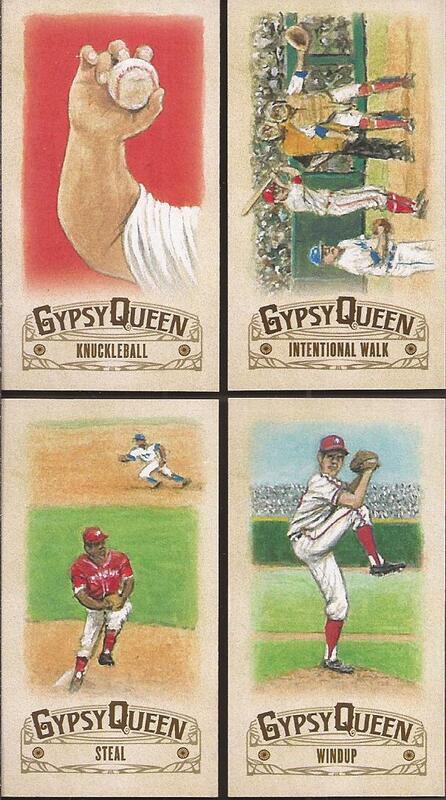 I really want to complete this GQ insert set. Unfortunately I picked up a 5th (run down), so if you are looking for that mini, let me know. 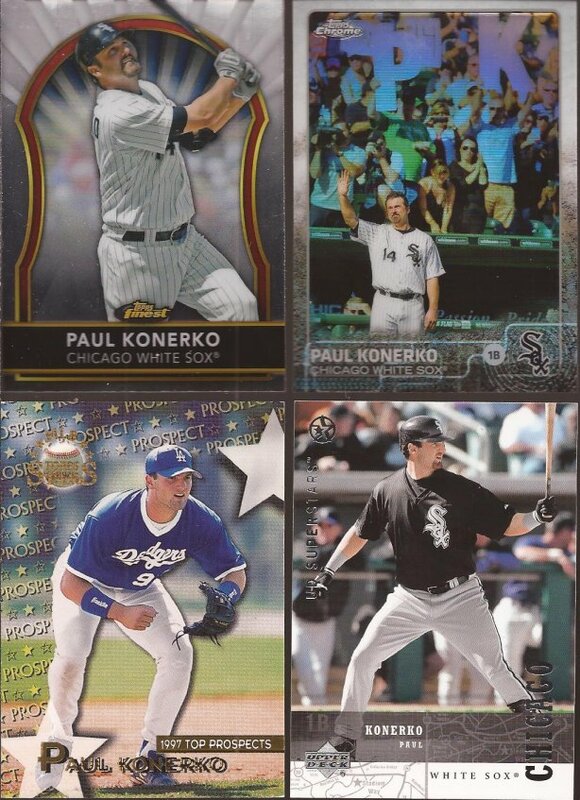 Four new for the Konerko binder. I was doubting my addition of the Topps Finest to my stack, but it turns out I didn't have it, so glad I took the chance. I have never see that UD Superstars at the lower right. The back is interesting with the Chicago sports timeline at the bottom. Two shinys for the Iguchi binder with a gold and a Bowman refractor. And while they don't fit, I'll pick up oddballs for my vintage player collections because why not and two quarters each. Last were three buckbacks for the frankenset. The Herbert kicks a '77 Metzger from the set. I think I made a wise choice. So all total, over 420 miles of driving and here's what I have to show for it (mostly). Thank goodness I drive a hybrid. I was thinking hard about going to that Coal City show; that's my fiancee's stomping grounds and we could have visited her family and knocked out two birds with one stone. In the end, it looks like you walked away with all the good stuff anyway - crisis averted! QT! And cards to boot. Well done! 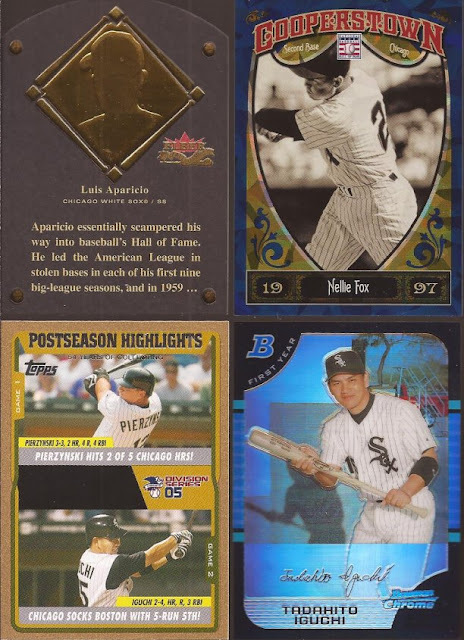 That's what I love about card shows: even disappointing ones can still result in a few successes here and there. Never heard of the card shop/card show in Buffalo Grove. I think I know the dime box guy you're referring to. Doesn't look like I missed a whole lot at that one. There are few things in life that I'd choose over sports cards... but meat is one of them. I've heard a lot about these Brazilian steakhouses. After seeing that photo... I'm definitely gonna need to go out and try it. A good day on the road going to card shows and casinos is much better than most days. Great pickups! 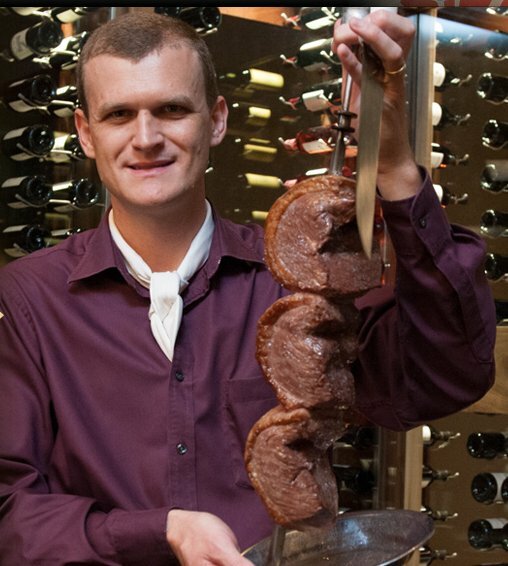 I need to go to a Brazilian steak house next time I travel for work. My wife would not be into that so I need to find a time when I'm by myself. I enjoy a casino trip a couple times a year. A few years back one was built within walking distance of PNC Park. 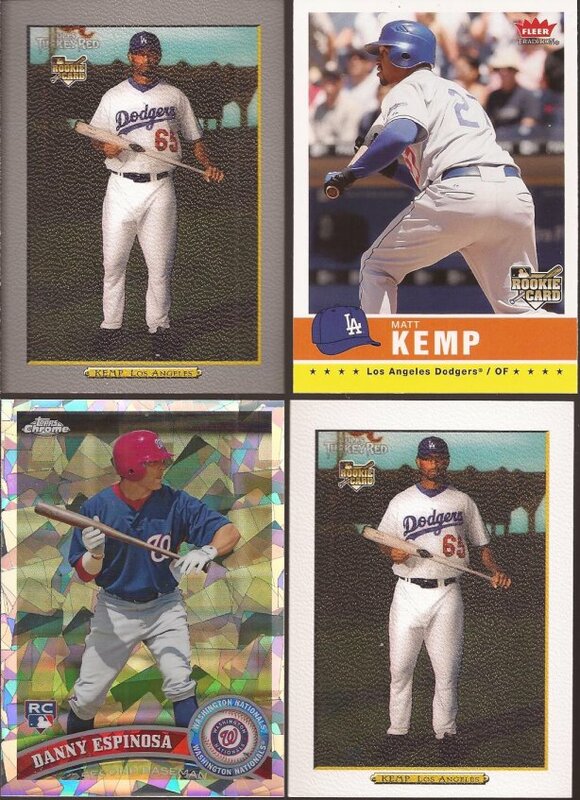 Nice cards, love that 2011 Topps Chrome Atomic refractor for 75 cents!